Bid arrivederci to tangled, kinked and heavy hoses. AQUA JOE's sleek Italian-made,soft-touch hose will change the way you water your yard and garden. The lightweight, kink-resistant, highly-flexible GELASTEX material is specially designed to expand up to 2.5 times its original length to reach up to 75feet in length and automatically retracts for quick and compact storage. Sturdy, dual-wall construction with leak-proof PVC connections fits standard spigots, sprinklers and irrigation accessories. BPA-free, Phthalate-free and Lead-free. Made in Italy. The all-season utility flat hose retains flexibility in all weather conditions (-10*C to +76*C). Its polyurethane hose construction has round to flat hose memory and is antimicrobial and drinking water safe for all gardening, camping, marine and RV applications. Equipped with lead-free all metal fittings provides durability yet it is extremely lightweight and will not kink. Made in Canada. The Flexible hose that grows to 50ft. Contract for easy storage. Expands with water pressure. Fits in palm of your hand. Lightweight. Kink & tangle resistant. Exclusive Amber tip tight seal connectors are 3x stronger than the original Pocket Hose. Revolutionary Dura-Rib construction. 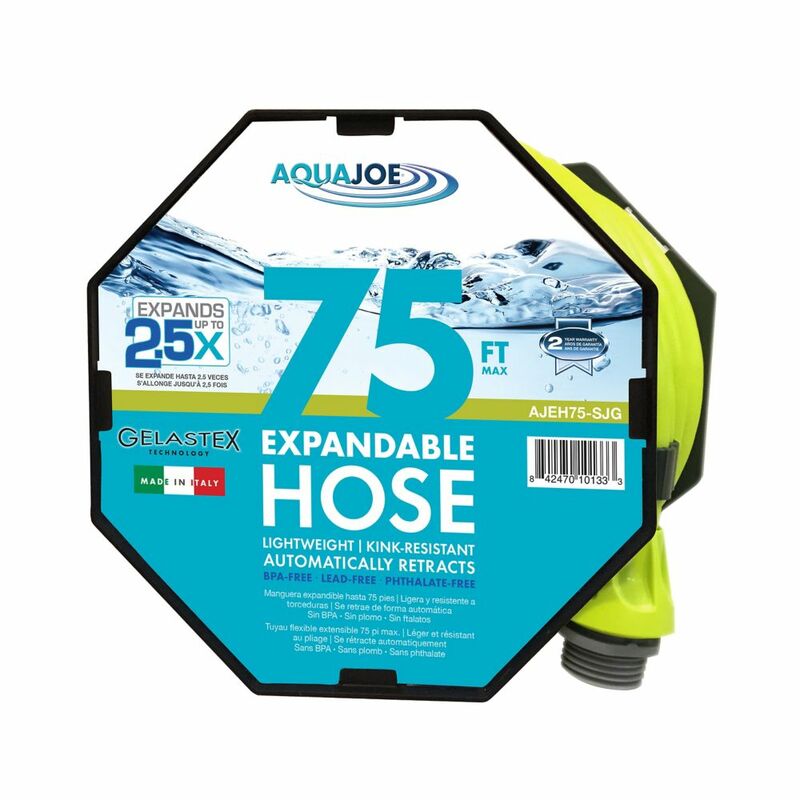 Aqua Joe 75 ft. Expandable Lightweight Kink-Free Hose Bid arrivederci to tangled, kinked and heavy hoses. AQUA JOE's sleek Italian-made,soft-touch hose will change the way you water your yard and garden. The lightweight, kink-resistant, highly-flexible GELASTEX material is specially designed to expand up to 2.5 times its original length to reach up to 75feet in length and automatically retracts for quick and compact storage. Sturdy, dual-wall construction with leak-proof PVC connections fits standard spigots, sprinklers and irrigation accessories. BPA-free, Phthalate-free and Lead-free. Made in Italy. Aqua Joe 75 ft. Expandable Lightweight Kink-Free Hose is rated 3.4 out of 5 by 87. Rated 5 out of 5 by James Handy from Sun Joe AJEH100-SJG Expandable Lightweight Kink-Fr Very good product so far. Easy to handle and store. Rated 5 out of 5 by Paul B from Best product I’ve ever owned. This product is by far the best quality compared to other hoses whether it is expandable or not. Rated 1 out of 5 by booku from Leaks easily and is not durable I bought this last winter and used it about 5 times this spring to water my lawn and backyard, before multiple leaks developed and I had to stop using it. Definitely would not recommend. Rated 4 out of 5 by Norman from The hose works well. Need a little more water pressure to fully expand then I expected. Over all ... The hose works well. Need a little more water pressure to fully expand then I expected. Over all satisfied. Rated 5 out of 5 by Lmb14 from Super simple to use!! The hose is exactly what I expected and I'm more than pleasantly surprised. I'm able to use it both inside and out - the material is soft and goes smoothly around corners, it retracts nicely and the color is bright so I don't trip on it. Not sure yet about the plastic fittings, but this seems to be a quality product so I'm hopeful. Rated 5 out of 5 by HerbCPA from GREAT PRODUCT This hose is vastly different from other expandible hoses which look like wrinkled vines. It's very lightweight and is leakproof from one end to the other. Rated 5 out of 5 by Carol Louise from Best hose ever! We have tried a number of different hoses but none compares to this hose. Because of the size of our property we purchased a 75’ for our front yard and a 100’ and two 75’ for our backyard. This was a big investment but well worth the price. The hose is lightweight which was an important factor. Rated 3 out of 5 by Richard from No water pressure with this hose.... No water pressure with this hose.